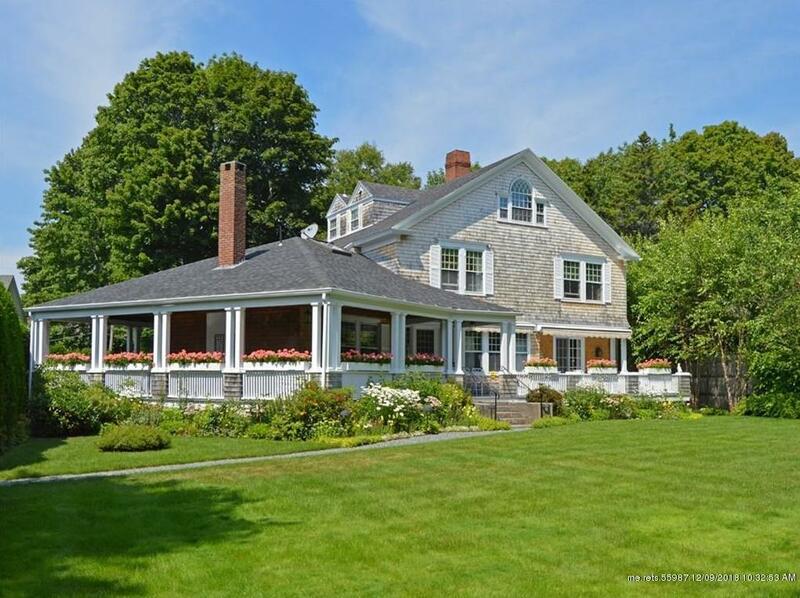 One of Northeast Harbor's quintessential shingle-style cottages built in the early 1900's by Fred Savage for S.D. Sargeant, 'Over-the-Way' rests on .53 acres +/-, with 6 bedrooms and 7 baths, and a full wrap around porch overlooking beautifully landscaped grounds and gardens. Fabulous entertaining is a breeze with the formal living and dining rooms with porch access, and a cozy library den for quieter times. A Butler's pantry just off the spacious kitchen and informal dining area brings family meals together in a jiffy. Propane fireplaces in the den and dining room add ease and comfort with a wood burning fireplace in the living room. Each bedroom upstairs has newly renovated full baths with showers. Nestled off South Shore Road with towering cedar hedges for privacy, but close to town and marina for maritime activities. Over-the Way - A rare gem that has been lovingly and meticulously cared for. (MLS #1367937) is a cottage single family home located in Mount Desert, ME. This single family home is 4,783 sqft and on a lot of 23,087 sqft (or 0.53 acres) with 6 bedrooms, 7 baths and is 119 years old. This property was listed on 12/07/2018 and has been priced for sale at $2,750,000. Listing Last updated 03/27/2019 12:00 PM CDT . Some properties which appear for sale on this web site may subsequently have sold or may no longer be available. Walk Score provided by Walk Score. Mapping data provided by Google and Bing.